Is that €2.50 for a beer and a sausage or extra for the sausage. More importantly do they have a veggie option? The Union team is actually their U23 team. Bumper crowd we think. First home game after the winter break and the weather is glorious. Enjoy yourselves. Say hello to GHF for me! Just done that for you Jean. Second half begins. Jena had most of the possession and all the chances but it remains goalless. Attendance 4,941, more than double their average. Guess we will find out why later when we get the stadium tour. Is every player called Unmoglich? Are the 4,941 all chanting RD's name now? The ref blows the final whistle. Jena walked that in truth. Union looked what they are, a reserve team. No injury time at all played, despite there being several. Magdeburg are running away at the top and there is only one team promoted. Sounds like an all DDR division Prague. German tier 4 = regional league. 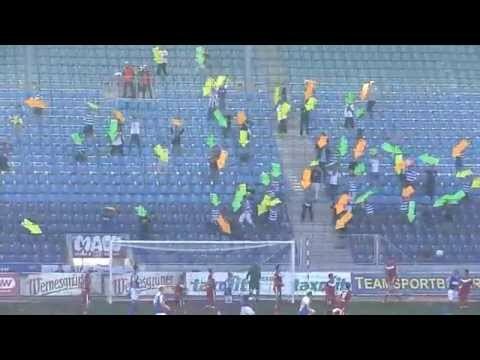 Was Magdeburg the club whose fans made giant arrows to point at the goal? Well, afterwards was a real education. Not just on the current situation, but also Jena's past. I really should have swotted up on the history, and remembered that Jena is also a fallen European giant from the 80s. Won at West Brom, among other feats. Will try and post some fotos tomorrow. GHF presented one of the ceramic poppies from the Tower to Andreas Trautmann of FCC (that's their favourite shorthand for the club name) on behalf of Charlton fans. Oh and cancel my previous post about the league table. I'd been looking at an out of date one on Soccerway. Zwickau are top, Magdeburg on their heels. FCC are in 4th, with a seven point gap to make up. But the FCC story is about far more than this seasons table, as we've now learnt. Thanks for letting us know how the adventure is going, PA. Pleased to hear that you're both having a great day. Pleased the day is going well for both of you. Were they heavily subsidised by the DDR state during their glory years? My guess is that would originally have happened because there weren't enough big clubs in the DDR. I would imagine that originally they were part of the lens factory? They were also a "focus centre" for development of players for the national side, apparently. As far as I can see, there was a fortuitous element in it that they were a smaller club that got into the top rank around 1960 under their own steam, at just the right time to benefit from the above arrangements. Lokomotiv, Red Star... all those names had a certain exotic excitement to them. Think Dynamo Dresden and Dynamo Berlin were the favoured clubs of the secret police. I just read on wiki that Dynamo = police club and Vorwaerts = army club. Yes, I remembered the name of Vorwaerts. Neither they nor Dynamo Berlin exist anymore, and I think Dynamo Dresden went under, only to be reformed. Lokomotiv Leipzig has gone too. You didn't want to travel to any of them on a cold dark night in February for a European Cup tie.